OpenStreetMap is a popular crowdsourcing platform containing a huge database of geotagged information including POIs, roads and buildings. This geodata has been added to the database with the help of volunteers since 2014. The tool helps users identify POI objects that have likely been tagged to the wrong location. It does this using co-location pattern mining techniques, which are based on generating spatial association rules. 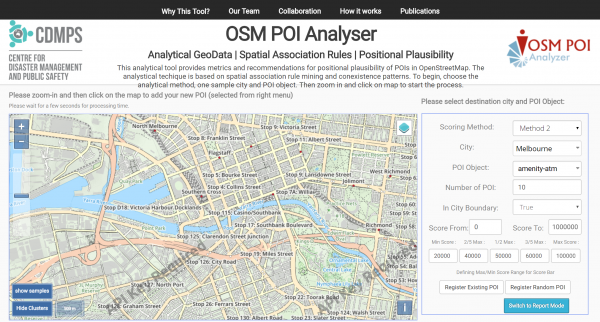 The OSM POI Analyser was presented at the State of the Map Conference in Japan in August 2017. This presentation can be viewed here. The tool itself is freely available at http://openstreetmap.me.